If you’ve ever cooked an entire Thanksgiving turkey dinner then you know it’s all about surviving. As far as I’m concerned, anyone who does it all from scratch deserves a one-week cruise in the Bahamas! I do it all from scratch: the turkey & mashed potatoes, the gravy, the stuffing, cranberries, green beans, and pumpkin pie. How do I survive? By doing everything I possibly can… in advance. One week ahead: I bake my easy white bread with 1 Tbsp. sugar and dry it to make cubes for the stuffing. The dried cubes keep well for days but they must be completely dry. Two days ahead: I make turkey stock using two turkey wings. I rub them with oil, salt & pepper, and roast them on a sheet at 375° F for an hour. Then I put the wings and drippings in a soup pot with about 8 cups of water and all the same veggies & spices as my chicken soup. I cook it for 3 hours, strain, cool & refrigerate. Then I skim the fat off the top before using. Oh, I take the meat off the wings for snacking – it’s delicious! I also cook the fresh cranberries. One day ahead: I bake my pumpkin pie and make my gravy and stuffing. Obviously, not everyone wants to work this hard so a store bought loaf of white bread is fine and you can use chicken stock (Swanson’s unsalted in the carton is good). Some people like to crisp the stuffing in the oven but I prefer it soft. It feels more like it was cooked inside the bird that way. 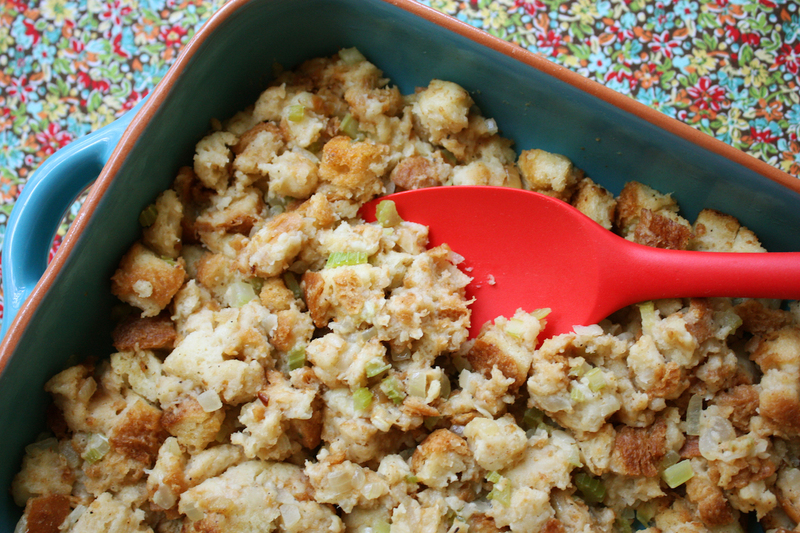 6 Comments on "Simple Make Ahead Stuffing"
Jenny, I made stuffing using your recipe and it was sumptuous! I also added diced roasted chestnut. My son wants me to make it again very soon! Thank you! We all loved you on youtube! You were so joyful and funny and many of us watch dozens of videos from other folks too. Sure miss seeing your videos. Though I also watched your talk show back in the day, I guess I just enjoy seeing you smile and laugh. Thank you for sharing your love of food and cooking! OMG, I just realized who you are!! I just watched your entire video of making an apple pie. Love it! I used to watch your talk show all the time. You were such a delightful host and I always enjoyed your show. After watching your video and eyeing some of your recipes, Jenny sure can cook! Hey I’m sorry to post on this. But for the ribs can I use lemon juice as you mention in the recipe or is it better to use actual lemons? I have only used fresh lemon juice. I’m not sure that bottled stuff would have enough bite to it.